There is no country in the world in which I enjoy travelling more than Spain. There is, for that matter, no country I have travelled more extensively than Spain. I have been to a greater percentage of Spain’s regions than American States. And there is no region in Spain I enjoy – or have travelled to more often – than the Basque Country. 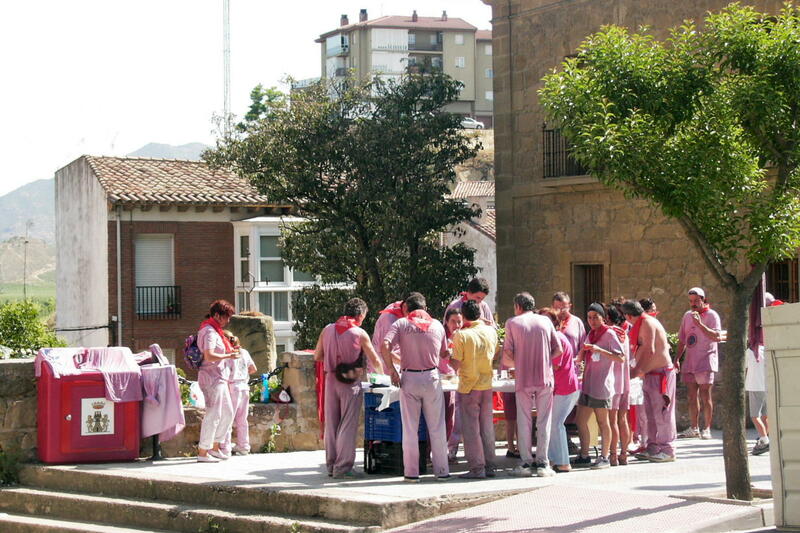 As participants in the Battala de Vino, these folk just spent the morning as contestants in a pitched battle outside the town of Haro, the capital of the La Rioja wine region on the southern border of the Basque Country. Following a march from the main town square to a neighboring hillside, they faced off against each other armed only with bota bags filled with the region’s prized product. 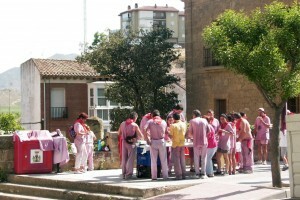 While they may not have turned water into wine they were certainly effective at turning white shirts pink. As much as I love Spain, the Basque Country and its people, I would not be telling the full truth if I did not acknowledge that it is in part the food that keeps bringing me back. 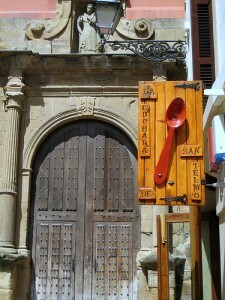 The Basques have a long history of culinary excellence and a culture in which food is central. Part of it is a long-standing worldliness of the Basque people dating back to their days sailing the world. There are theories that the Basques may have been the first Europeans to reach American shores (they seem to have left quite a few of their language’s proclivity for the use of the letters “x” and “z” behind them in Mexico). Another part of it has been a willingness to adopt what was best from other cultures and lands. 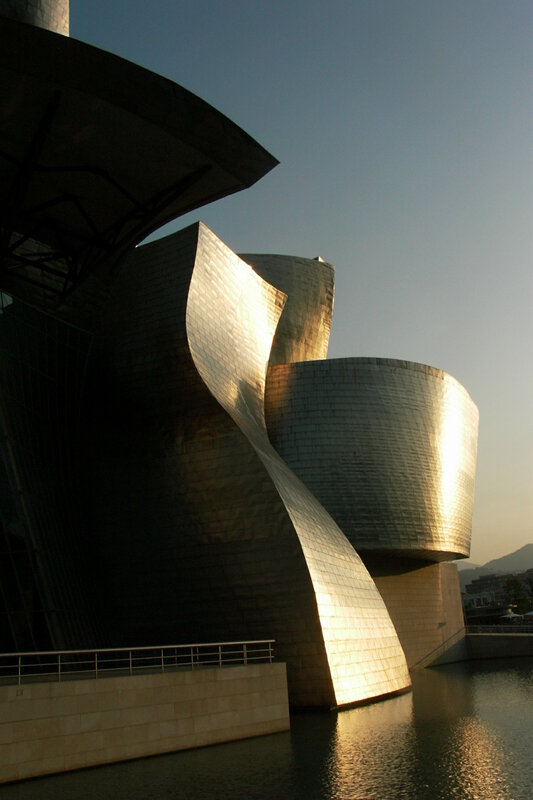 Basque culture features a long tradition of Gastronomic Societies – mens’ clubs offering communal meals paid for and prepared by the members at a very high level. Another Basque culinary offering is the traditional Sideria, large country restaurants offering heaping buffets of traditional Basque food to be washed down by local hard cider. Say “Basque Cuisine” now, though, and what is thought of most often are the spectacular restaurants in and around the Basque Country’s capital city of San Sebastian (Donostia is the name in the Basque language). From the groundbreaking Arzak to the nearly perfect Restaurant Martin Berasutegi to my favorite, Mugaritz, it is no exaggeration to say that there is no city in the world with more restaurant stars per capita than San Sebastian. 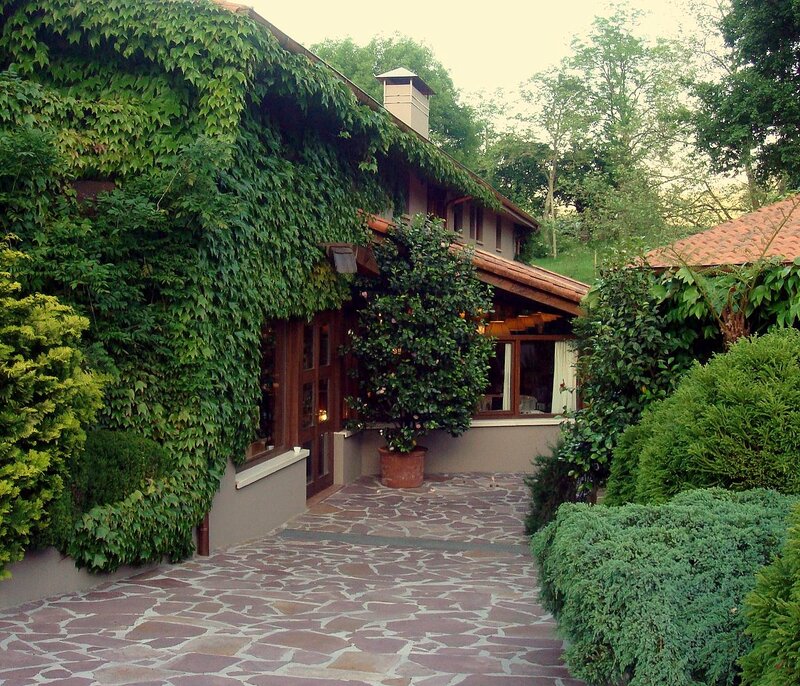 Mugaritz and Arzak are both listed amongst the top 10 restaurants in the world in the widely-regarded San Pellegrino Awards (with another nearby restaurant, Asador Etxebari, in the top 50). But as spectacular as San Sebastian’s high end cuisine undoubtedly is, it is the Pintxo bars – tapas are known in the Basque Country as “Pintxos” – of the City that may be its great glory. The streets of the old town are lined with the bars. As many as there are, though, it can sometimes be a challenge to find a place at the bar. Most of the establishments offer at least several of the usual classics. 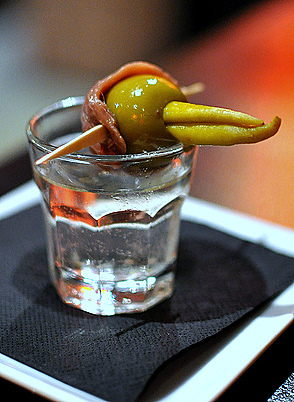 My favorite is the Pintxo Gilda, an absolutely perfectly balanced and somewhat heady combination of Basque peppers, olives and anchovies on a skewer. But each of San Sebastian’s tapas bars has its own specialty. 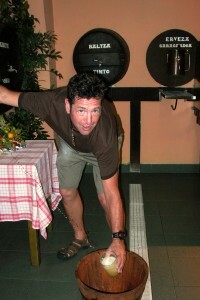 An experienced tapas crawler knows that a really good crawl is an endurance event rather than a sprint. The secret is to order each bar’s specialty. Perhaps my favorite is the tuna stuffed tomato at La Cuchara San Telmo. It is a variation on bacalao (salt cod) stuffed piquillo peppers, a classic Basque pintxo that can be found at nearly every San Sebastian bar. The La Cuchara San Telmo version trades a tomato for the piquillo peppers and tuna for the bacalao. 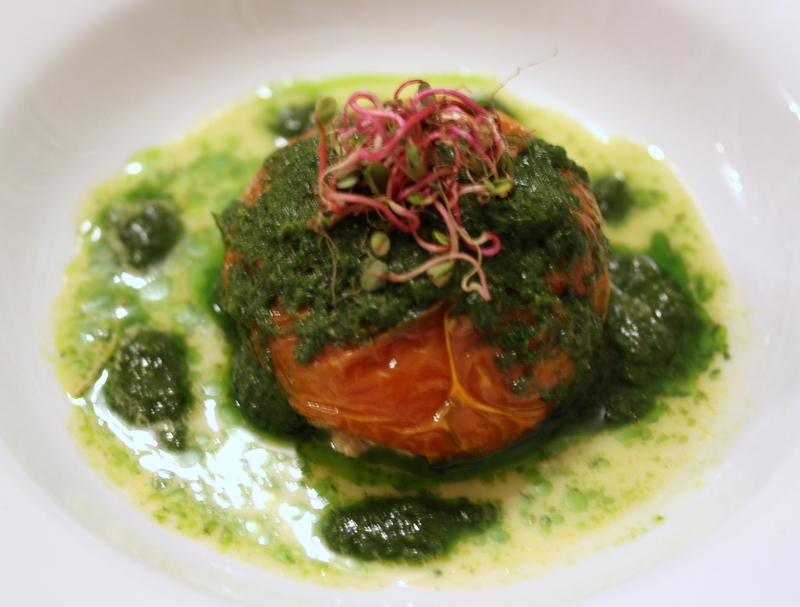 The dish can be made with peeled tomatoes or with the skin on, with the tuna filling pureed to a velvety, moussey goodness, and with any of a number of variations on the original’s parsley oil. With local Farmers’ Markets offering wonderful fresh dill, for our version we opted for a dill vinaigrette. While a lone tuna stuffed tomato might seem like an inadequate weapon with which to fend off the collapse of the Euro, as the highlight of the first stop of a San Sebastian tapas crawl it is surely not a bad way to start forgetting about it for the evening. 1. Prepare the Tomatoes. Skin the tomatoes, first by cutting out the core with a sharp knife and making a ‘+’ incision on the other end of the tomato. Then place in a pan of boiling water for 10 seconds, remove and plunge into a bowl of iced or very cold water. Slice the tops off the tomatoes. Remove the seeds and insides, either with a teaspoon or small, sharp knife. 2. Stuff the Tomatoes. Add the tuna, aioli, tomato sauce and parsley to the bowl of a food processor and pulse to combine before processing to a smooth, mousse-like texture Stuff the tomatoes, firmly pressing the filling down. If keeping to serve later, brush them with olive oil and black pepper to prevent them from drying out. Cover with clingfilm and keep. 3. Make the Vinaigrette. Blanch the fresh dill in boiling water. Plunge the dill into ice water to stop the cooking and wring dry. Combine the dill with the remaining ingredients in the bowl of a high speed blender. Starting on the lowest speed process the Vinaigrette to combine, gradually increasing the speed until it is going full bore and the Vinaigrette has achieved a tight, pureed sauce texture. 4. Finish the Dish. Place a stuffed tomato on each plate, cut side down. Drizzle some of the vinaigrette over the top of each tomato. Garnish the plate with some sprinkles of Spanish Paprika. Garnish the tomato with some crystals of good quality finishing salt and the radish sprouts.